Before NASA kicks off the design and construction of its next large-scale space telescope, an independent review board will evaluate the scope and expected cost of the project, the agency announced Thursday (April 27). The Wide Field Infrared Survey Telescope (WFIRST) was officially approvedas a NASA mission in 2016. The space-based telescope will study the cosmos with a field of view 100 times larger than the Hubble Space Telescope. Like Hubble, it will help scientists study many aspects of the universe, and will be especially well suited to help scientists learn more about the mysterious force driving the expansion of the universe. "Developing large space missions is difficult," Thomas Zurbuchen, associate administrator for NASA's Science Mission Directorate, said in a statement from the agency. "This is the right time for us to pause for an independent look at our plans to make sure we understand how long it will take, and how much it will cost, to build WFIRST." WFIRST will be the latest in a long line of large-scale NASA space instruments, including the Hubble Space Telescope, the Chandra X-ray Observatory, the Spitzer Space Telescope and the James Webb Space Telescope, which is scheduled to launch in 2018. WFIRST is currently in the "formulation phase," meaning its design has not been finalized. The WFIRST instrument will capture infrared light, which has a longer wavelength than optical light invisible to the human eye. This wavelength range is ideal for studying distant objects that are moving away from Earth as the universe expands — as those objects move away, the light they emit gets stretched out (as seen from Earth), giving it a longer wavelength. The expansion of the universe is driven by what scientists call "dark energy" — a mysterious, unexplained cosmic engine. In addition to dark matter studies, WFIRST would "complete the demographic survey of planets orbiting other stars, answer questions about how galaxies and groups of galaxies form, study the atmospheres and compositions ofplanets orbiting other stars, and address other general astrophysics questions," according to the statement from NASA. There are typically many proposals for instruments that NASA could select as its next large-scale mission, and selecting just one is a process that is largely influenced by the National Academy of Sciences' Astronomy and AstrophysicsDecadal Survey. This once-per-decade report is assembled over many years by groups of scientists who evaluate the state of these fields and make recommendations for the types of missions (or specific missions) that NASA should pursue. The agency typically follows the recommendations of the Decadal Survey. 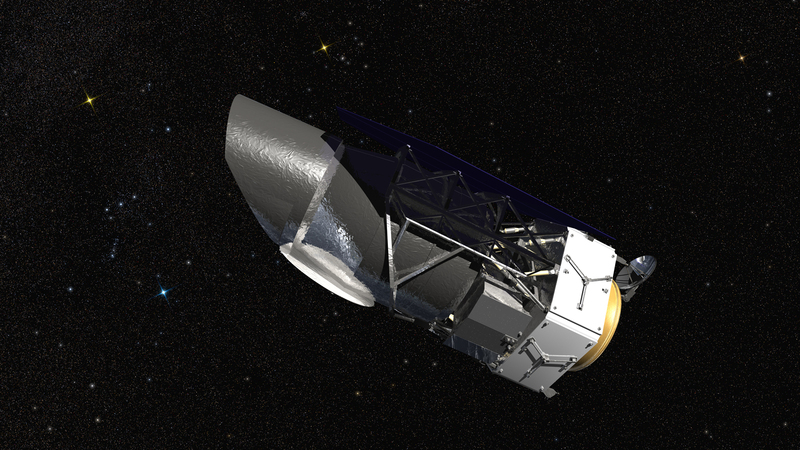 The 2010 Decadal Survey recommended that NASA pursue WFIRST, although planning for the mission was delayed by budget and schedule overruns in the JWST mission. An independent review of JWST in 2011helped NASA create a revised cost and schedule, which the agency has stuck to, according to the statement. The NAS Decadal Survey board recently produced a midterm assessment report, which provided NASA with recommendations for upcoming missions, including WFIRST, based on the adjusted budget and schedule for JWST. The report reiterated its assertion that NASA should pursue WFIRST, but also added that the agency should invest in an independent review like the one done for Webb in 2011. The midterm report recognized that "cost growth in the planned WFIRST project could impact the balance of projects and research investigations across NASA’s astrophysics portfolio," which is what happened with JWST's expanded cost and schedule. The review of WFIRST comes much earlier in the mission's timeline than the review of JWST, and could help the agency avoid a similar situation with WFIRST. The review panel will consist of "senior engineers, scientists, and project managers mostly from outside NASA who are independent of the WFIRST project," the statement said. The review is expected to be completed "within approximately two months." "NASA is a learning organization," Zurbuchen said in the statement. "We are applying lessons we learned from Webb on WFIRST. By conducting this review now, we can define the best way forward for this mission and the astrophysics community at large, in accordance with the academy guidance."